Title: 09/26/1986 - General information related to the Hazard Communication standard. Mr. Albert G. Romanchuk, Sr. Thank you for your letter of September 5 requesting information from the Occupational Safety and Health Administration (OSHA) related to the Hazard Communication standard. We are sending you a copy of OSHA's safety and health standards as well as a copy of the hazard communication standard compliance directive which provides the agency's interpretations of the general application of the standard (OSHA Instruction CPL 2-2.38A and Change 1). For your convenience, I would like to enter into a brief description of the requirements of the hazard communication standard. The provisions of the Hazard Communication Standard are primarily performance based. Accordingly, the effectiveness of the employer's hazard communication program will depend on the extent to which it achieves compliance with the standard. All such programs are required to be in writing [29 CFR 1910.1200(e)] and must make provisions for labeling and material safety data sheets [29 CFR 1910.1200 (f) and (g) respectively] and provide for employee training [29 CFR 1910.1200(h)]. The hazard communication standard also establishes labeling requirements for shipped containers and for in-plant containers. Labels for both kinds of containers must contain 1) the identity of hazardous chemicals and 2) appropriate hazard warnings. In addition, labels on shipped containers must include the name and address of the manufacturer, importer, or other responsible party. Currently the hazard communication standard requires that hazard communication programs be developed within all manufacturing industries classified within Standard Industrial Classification (SIC) codes 20-39. Even though the standard's coverage is limited, the Agency nevertheless intended to provide limited coverage to other users of hazardous chemicals. This is done through the standard's labeling provisions. The main purpose for the label identity is to provide a link back to the manufacturer of the hazardous substance and the material safety data sheet. Since non-covered employees (that is, employees in industries other than manufacturing) will generally not be provided with material safety data sheets, the requirement for appropriate hazard warnings on the label becomes the most useful information element for this group of workers. 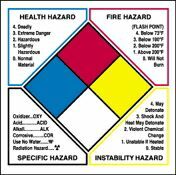 The standard does not define the term "appropriate hazard warning"; however, it does define "hazard warning" to mean any words, pictures, symbols, or combination thereof appearing on a label or other appropriate form of warning which conveys the hazard of the chemicals in the container. The Agency believes that it is critical for employees to know and understand the potential hazardous effects associated with the chemicals encountered in the workplace so that they will appreciate the hazards and cooperate in limiting the potential for harm. Labels on shipped containers containing hazardous chemicals must include the hazardous effects of exposure. This will ensure that non-covered employees, who generally will not receive training or be provided with a material safety data sheet, are provided with minimal information to make them aware of the hazardous effects of the chemicals with which they work. Covered industry employers with required hazard communication programs are permitted to utilize any in-plant labeling system that is effective to convey the hazard of substances to which their employees are exposed. Please feel free to contact us again if we can be of further assistance. We are considering purchasing a building in the County of Wyoming, Town of Warsaw, New York and setting up a business manufacturing floor finishes, sealers, cleaners and stripper. Warsaw is zoned for manufacturing, and we would appreciate any information you could send us concerning manufacturing, safety standards and requirements for labeling and data sheets.